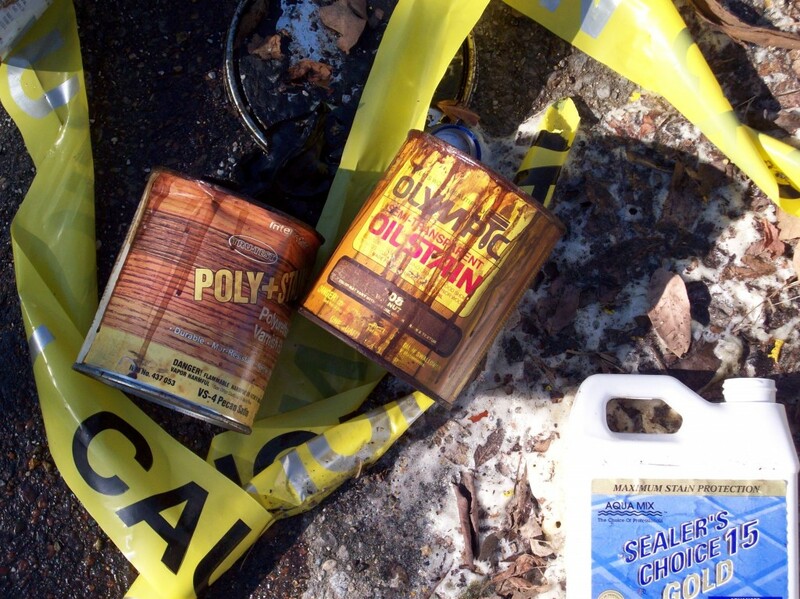 Chemicals seeped from cans to a strip of wood separating the asphalt from the soil. Picture taken one week after discharge. UPDATE: San Luis Obispo city attorney Christine Dietrick said in an email Wednesday afternoon that the San Luis Obispo fire department which lodged the notice of violation against the city is a CUPA participating agency overseen by San Luis Obispo County Environmental Health. San Luis Obispo city fire department officials have lodged a notice of violation against the city’s public works department for the illegal dumping and disposal of hazardous wastes. 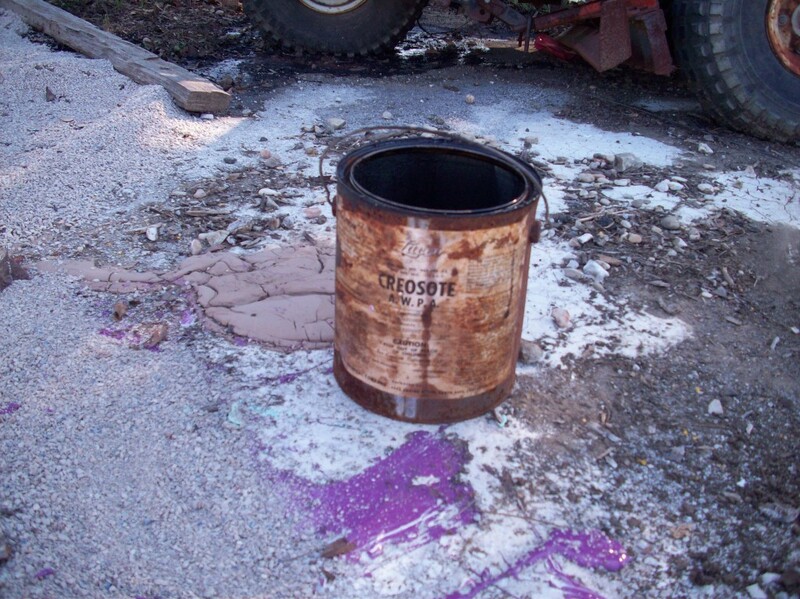 In the February 17 notice of violation, Fire Department Hazardous Materials Coordinator Kerry Boyle claims city staff violated 16 laws regarding the city’s dumping, disposal and supervision of hazardous chemicals. In citing the city, Boyle reversed his earlier claims that the purposeful dumping of dozens of gallons of chemicals including acetones (solvents), varnish, epoxy, creosote, enamel paint and latex paints onto the ground not far from a waterway did not require reporting to other agencies or citations. In January 2011, waste water collections supervisor Bud Nance told staffers to remove the contents of the hazardous waste storage shed at the city corporation yard on Prado Road and empty cans in the yard. After about two weeks, the chemical dump was reported to Boyle who inspected the site. At the time, Boyle concluded that the city was not required to follow laws regarding the disposal of hazardous materials. Instead, he allowed city staff to pour kitty litter onto the chemicals and then transport the waste to the Cold Canyon Landfill for disposal. Boyle determined the release did not “meet a reporting threshold,” said Aaron LaBarre, supervising environmental health specialist for San Luis Obispo County Environmental Health Services. At that time it was determined there was no need to file a notice of violation. However, dozens of emails between city managers and staff note that the dumping created a hazardous situation and needed to be correctly reported and cleaned up. The emails show some San Luis Obispo city employees attempting to downplay or hide the problem. Following an exclusive CalCoastNews story on the incident, the California Department of Toxic Substances Control (DTSC) and the Environmental Protection Agency (EPA) sent investigators to the Central Coast to look into the deliberate dumping of the chemicals. And while city officials say they have been warned the city and some staff face civil and criminal penalties, no arrests have yet been made and no fines have been levied. On February 17, a few months after the EPA and DTSC started their investigations and more than a year after the toxic release, Boyle sent the city the notice of violation. The citation asks the city to agree to develop a work plan to assess the level of contamination and to make changes in its policies and procedures to avoid further incidents. Under the California Public Records Act, CalCoastNews sent a request for a copy of the notice of violation to LaBarre. It took almost three weeks, a violation of the act, before officials released the public document to CalCoastNews. On March 16, San Luis Obispo city attorney Christine Dietrick wrote Boyle a response that says the city objects to the notice of violation. She notes that the city is also already facing criminal and civil penalties from other agencies and should not have to respond to allegations from a lesser agency. Nevertheless, Dietrick provided rebuttals to the majority of issues raised by Boyle. In her response, she argues that the cost of assessing the contamination far outweighs the benefit to public health. She calls the request unreasonable. In response to allegations the city broke the law when it illegally disposed of the hazardous waste-soaked kitty litter at the Cold Canyon Landfill, Dietrick argued that the notice of violation did not provide basic information she needed to respond to the allegations. Even so, she wrote that the city is currently reviewing policies and procedures as to operate legally in the future. 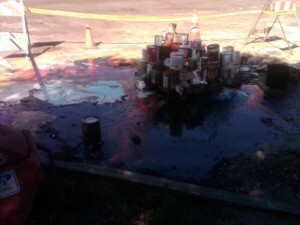 The notice of violation also accuses the city of failing to legally label chemicals, separate incompatible wastes, adequately train personnel, and to properly maintain and operate the corporate yard to minimize the possibilities of fires, explosions and the unplanned release of hazardous materials. Hey man, don’t we want government to have some common-sense efficiency, like private business, or your personal household? Well then this is SOP. How much toxic s**t do you think the garage truck hauls away every week when it comes down your street? You put palm fronds in your green waste or candy wrappers in your recycling and you WILL get a nasty note from the garbage company (though they’ll take the stuff anyway unless you re-offend). I’m not thinking the garbage is subject to the same scrutiny. They TELL you you to evaporate paint and THEN put it in the garage. It almost sounds as though this guy was telling his guys to do it the right way as opposed to pouring it down the drain old-school.